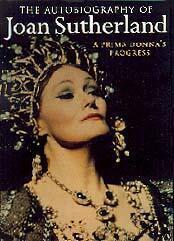 Last month Dame Joan Sutherland was in New York to launch her new autobiography, A Prima Donna’s Progress (Regnery Publishing, Inc.Washington , D.C. ISBN 0-89526-374-2). Lines stretched around the block for her masterclass and symposium with Marilyn Horne at the Julliard School of Music, followed by a book signing at the Metropolitan Opera shop. Many of the faithful had probably never heard Sutherland in her prime; they just wanted to glimpse the 71-year old legend. Older fans flocked to express their gratitude for the operatic thrills Sutherland had given them in the decades prior to her 1991 retirement. I was fortunate to speak with Dame Joan in her suite at the cozy Lotos Club, her Manhattan digs since1963. Though suffering from a bad chest cold, the diva is a trouper, as befits a former daughter of the regiment. She wore one of those sensible boxy suits designed by some sartorial Svengali to offset her athletic figure. When she turned to put down her needlepoint, I noticed that her famous crescent-moon profile has softened with age. She still has the energy of a woman half her age, though the towering casque of auburn hair that Noël Coward once compared to the MGM lion’s is now touched with grey. After fiddling with the air conditioning (like any nervous singer), she confessed that writing an autobiography hadn’t been her idea. British publishing magnate Lord Weidenfield, who was also a director of the Royal Opera, Covent Garden, urged her to share her experiences with the reading public. "He guessed it would take about eighteen months to write but I knew he was dreaming." In the end the 486-page tome, started in 1992, took 4 1/2 years. The narrative carries us from turn-of-the-century Australia to the diva’s 1994 cameo as Mother Rudd in the outback movie Dad and Dave On Our Selection. At least four major Sutherland biographies have appeared in recent years with her cooperation, but none of them was officially authorized. Sutherland approves of Norma Major’s book but was "rather cross" with Quaintance Eaton for not letting her read Eaton's manuscript before it was published. "Quaintance’s book is dicey. There are several errors I could have corrected." Sutherland’s habit since 1947 of keeping every concert program and press clipping guaranteed that her own book would be thoroughly documented. "We kept scrapbooks because my husband knew that someone might want to write a biography. I never thought it would be me." Sutherland started out typing the book on a word processor, which was easy because she had worked as a stenographer back in the 1940s. But she found that the computer screen hurt her eyes, so she finished the manuscript in longhand and her secretary transcribed it. The result is a painstakingly detailed enumeration of every costume, rehearsal, performance, curtain call, colleague, party, voyage and recording session in Joan Sutherland’s forty-year career. Sutherland is aware that the book has been faulted for these laundry lists and is the first to admit that she is not a born writer. "Perhaps it is rather factual and maybe it is too detailed. Yes, I even mention when I went to the hairdresser. But I was trying to show young artists how much more is involved in a career than just singing." Unfortunately the book contains almost no maxims or advice that might be useful for young singers. Sutherland also includes innumerable (mostly good) newspaper reviews. "I reprinted my early crits to illustrate the way my voice progressed. Reviews certainly gave me the confidence to continue in what turned out to be the right direction." As Canadian opera buffs know, Sutherland had a special relationship with Canada, making many of her world debuts in different roles in Vancouver and Toronto: as Donna Anna (1958), Norma (1963), Lucrezia Borgia (1972), Anna in The Merry Widow (1976) and Sita in Le Roi de Lahore (1977). Her book fondly mentions Canadian singers Joseph Rouleau, Pierrette Alarie, Léopold Simoneau, Huguette Tourangeau, and Judith Forst. "Joan was already famous when she came to Vancouver," recalls Irving Guttman, artistic director of the Vancouver Opera Association in the early 1960s. "So we were honoured to have her. She helped put Vancouver on the world opera map and she helped several young Canadian singers like Tourangeau." Guttman isn’t surprised that Sutherland’s autobiography takes no risks. "That’s the way Joan was, a very hard worker but quiet and unassuming. A gossipy book wouldn’t be like her at all." Regarding her husband Richard Bonynge’s controversial years as the head of the Vancouver Opera Association (1973-1980), Sutherland plays dumb. For a full account of that story one must refer to previous Sutherland biographies and David Watmough’s excellent biography of Irving Guttman, The Unlikely Pioneer (Mosaic Press). When I confronted Sutherland about her "speak no evil" writing style, she explained that her book was first published in England where strict libel laws apply. Lord Weidenfield’s lawyer vetted the manuscript and Sutherland was obliged to delete three pages of quotations. "Anyway, I am not very keen on gossip," she claims, despite a copy of Kitty Kelly’s The Royals on her bedside table. "Someone gave it to me because they thought it was banned in Europe. But I really don’t like it, it is so rubbishy!" Discretion may be the better part of valour, but it is the worst part of biography. Sutherland’s book is full of potentially fascinating moments, like vacations with Noël Coward, a game of strip poker with James Morris (we also learn that Morris was arrested in Vancouver for possession of an illegal weapon which he showed to a prostitute), and a horse that farted in Fiorenza Cossuto’s face. Sutherland alludes to "hilarious times" and "many laughs" but, alas, she can’t tell a joke. The only time she gets personal is against conductors like Nello Santi and Molinari-Pradelli who didn’t do things the Sutherland-Bonynge way. She also has harsh words for Pavarotti’s lack of preparation for the recording of Donizetti’s Maria Stuarda. When I mentioned that Pavarotti was opening the Metropolitan Opera’s L’Elisir d’Amore in just a few hours, Dame Joan presciently remarked that he will probably cancel (indeed he did withdraw after two performances). As far as the written word goes, A Prima Donna’s Progress is La Stupenda’s final testament. Though she has benefitted enormously from the vocal treatises written in previous centuries, she will not be writing any technical manuals herself. "I’m sick of books," she sighs. "I just want to go home to Switzerland for a jolly good rest." None of her fans will deny that she has earned it. Note: London-Decca will release its 1987 Sutherland-Pavarotti recording of Verdi’s Ernani for the first time in March 1998.